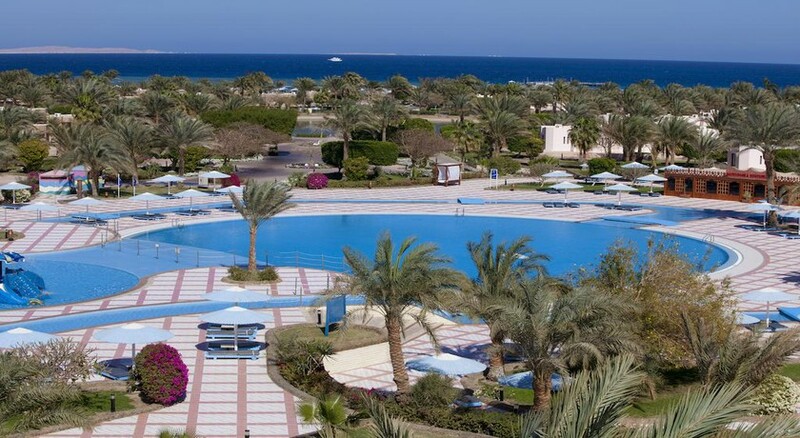 The Pharaoh Azur Resort is a perfect blend of Arabian styles located on its own private beach on the azure blue Red Sea shore, and surrounded by spectacular landscaped gardens, pools and terraces. This luxury 5 Star Hotel offers an array of indoor and outdoor activities, outstanding dining venues, sports activities and spectacular pool area as well as 360 unique guest rooms, family rooms, and bungalows with modern amenities. This is where the cool waters of the Red Sea and the warm Egyptian hospitality combine to create the memories of a lifetime. 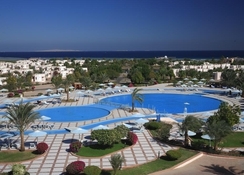 Hurghada Airport is 12 km from the Hotel. 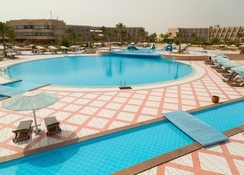 Local Tips: The hotel is in a perfect position for visits to the Sinai Peninsula, Suez and Marine Life Museum, and the Giftun Islands. Please note: Rates and conditions are not valid for Egyptian passport holders. Food, drink and entertainment: Bed and Breakfast with options for Half Board and All Inclusive. There are several dining choices including the Karnak dining room main restaurant for breakfast, lunch, and dinner with themed nightly buffets, the Lobby Bar and Terrace with a choice of cocktails and beverages and light fare with nightly entertainment open 24 hours daily, indoor and outdoor service at the a la carte Valentino's Italian Eatery, casual beach a la carte Sea Breeze restaurant for delicious seafood, the poolside Oasis Pool Bar and Restaurant, Farfasha Oriental Café for breathtaking views, and Shisha (water-pipe) with a wide selection of flavored tobacco and Oriental teas and coffees, the onsite Disco for dancing, cocktails, and the Spectra outdoor Amphitheater overlooking the resort's main swimming pool offering regular live show (in season). Sports, games and activities: Sparkling outdoor swimming pool with sun terrace, sun loungers and sun umbrellas, kid's pool, private 300 m beach, indoor heated pool with Jacuzzi, beach volleyball, beachfront Massage, water sports, including snorkelling and diving (dive centre onsite), two floodlit tennis courts, table tennis, Billiard tables, bicycle rental, shooting range, fully equipped Health Club with sauna, steam bath, Jacuzzi, fitness room and massage treatments, "Just Us Kids" Program for children ages 5 to 12 years with staff counsellors available to arrange activities, games and organize competitions. 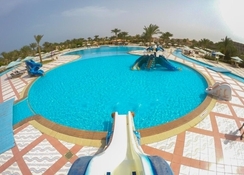 Additional: 24-hour reception, 24 hour room service and in-room dining, bank and money exchange, ATM machine, guest relations, doctor on call, laundry and valet service, fully equipped meeting room accommodate up to 350 guests, courtesy Shuttle Bus to and from Hurghada airport, message service, babysitting service, safety deposit box, Internet access, library, free car parking, car rental, gift and jewellery shops, hairdressers, honeymoon VIP, Christmas Eve and New Year's Eve gala dinners with supplement. The Pharaoh Azur Resort features 360 unique guest rooms, family rooms, and bungalows featuring a bathroom with bathtub and shower installation, hair dryer, individual climate control, remote control Satellite TV, mini bar, direct dial telephone, safe, fire alarm system and smoke detector (hotel-wide) and a private balcony or patio. Non-smoking rooms. Free baby cot available on request. Categories available are promo room (3 persons max), Garden Room (3 persons max), Sea View Room (3 persons max), 1 bedroom chalet bungalow with pool/sea view (4 persons max) and 2 bedroom chalet bungalow (6 persons max). Everything went smoothly and as planned. Lovely holiday. Not a good hotel at all. Our sheets were dirty when we got there. Don t go here in June farmers have holidays at this time and there is no food left for tourists.